Two scholars leading research at the intersection of learning, place and technology will discuss their work and answer questions during Facebook Live sessions hosted by the University of Washington College of Education in May. The Facebook Live sessions will feature Katie Headrick Taylor, assistant professor of learning sciences and human development at the UW, and Rogers Hall, professor of teaching and learning at Vanderbilt University and a visiting scholar at the UW this spring. 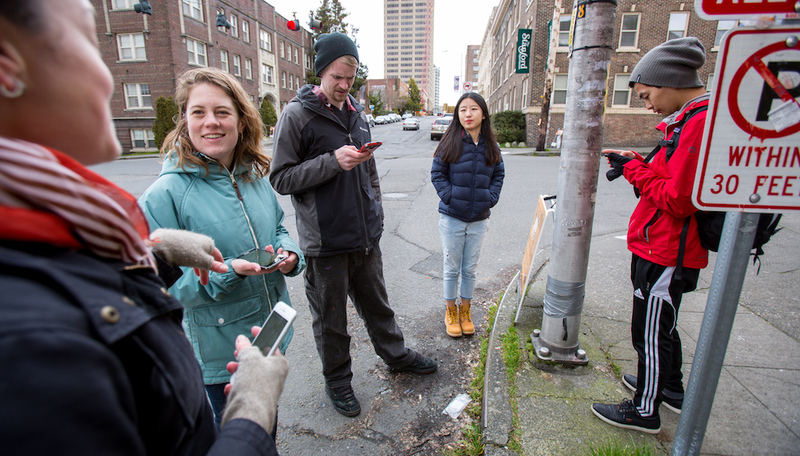 May 3: “Using the city as a classroom” — Taylor and Rogers will share insights from their community-based work in Seattle and Nashville, and how educators can use new, mobile and location-aware technologies to engage youth in their communities. Session begins at noon Pacific time. Watch the May 3 Facebook Live chat below. May 17: “The future of video-based research” — Taylor and Rogers will discuss their forthcoming article on video-based research and how the increasing availability of Go-Pro cameras, virtual reality video and other technologies are opening new possibilities in education research. Session begins at noon Pacific time. Both sessions will be broadcast on the UW College of Education's Facebook page. Submitting questions in advance for Taylor and Hall is encouraged to ecoe@uw.edu. Watch "Using the city as a classroom"